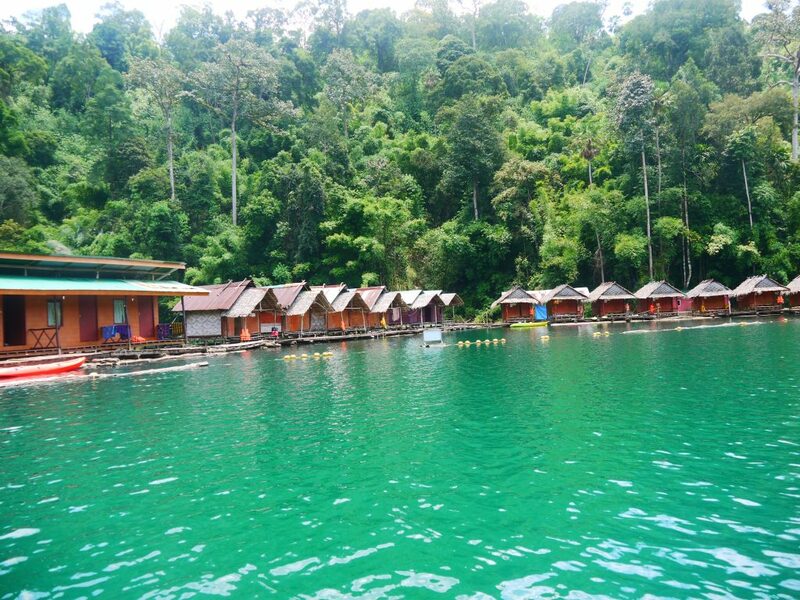 The Khao Sok lake one day tour is one of the best places to visit in Thailand. It’s also the best tour in Khao Sok for you to do. We stayed in Khao Sok for 2 nights and this top tour was number 1 on our Khao Sok lake tour itinerary. 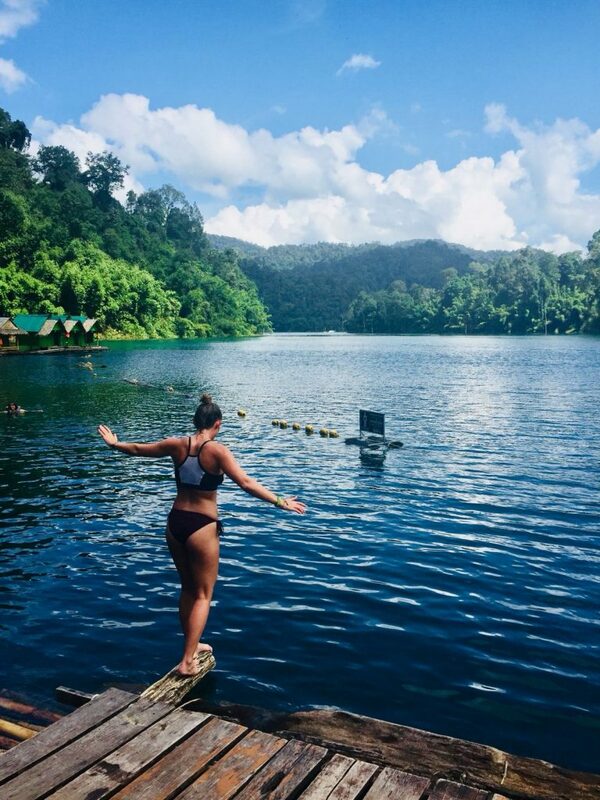 There was only one reason we came to Khao Sok and this was to experience the marvellous beauty of the Khao Sok emerald lake. We had three days planned to stay in Khao Sok and this was all focused on enjoying this best-kept-secret of Thailand. Khao Sok lake is actually a man-made lake created in 1987 with the construction of Rajjaprabha Dam and it’s in the Khao Sok National Park. In addition, the Khoa Sok National Park is a whopping 739 km² and is rainforest that is actually older and more diverse than the famous Amazon Rainforest, how cool is that! still unsure about visiting this top place to visit in Thailand? Let me change your mind with my experience. This is a full guide to the Khao Sok lake day tour and the best accommodation in Khao Sok. What is the Khao Sok lake one day tour? The Khoa Sok tour will take you on a journey you will never forget. You will experience a stunning lake, breathtaking landscape similar to Vietnam’s Halong Bay and some serious close encounters with wild animals, birds and reptiles. 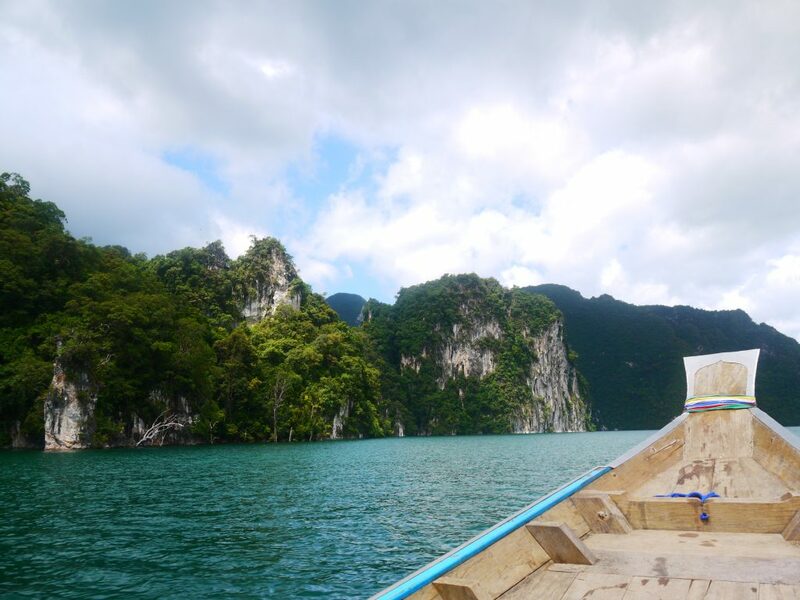 Also, you will get the chance to visit caves, swim and kayak in the Khoa Sok lake. Furthermore, you will tour directly through giant limestone formations and get the chance to take photos of the rain-forest that has more history than the Amazon. 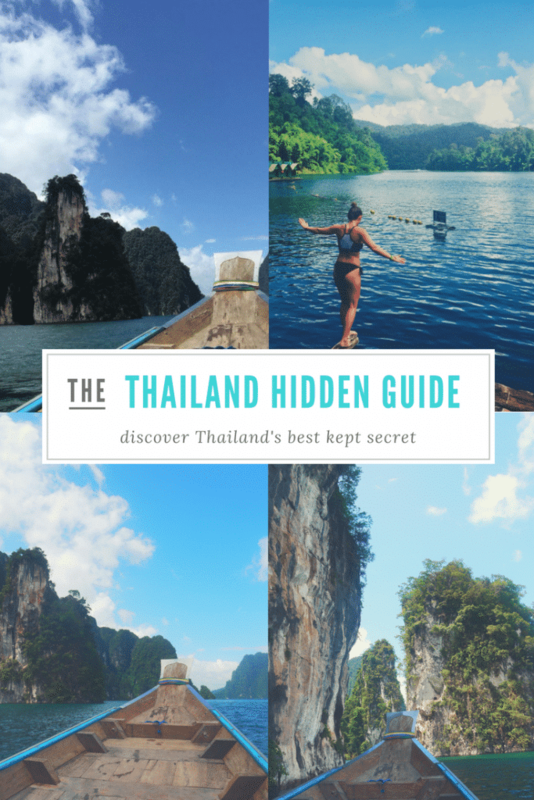 A funny English-speaking guide will spend the day explaining the history of the lake, guiding you and ensuring you have an unforgettable experience at Thailand’s most secretive top place to visit. The Khao Sok lake one day tour is broken up into morning and afternoon. Morning is better, but the full day is still mega fun and a surreal experience. 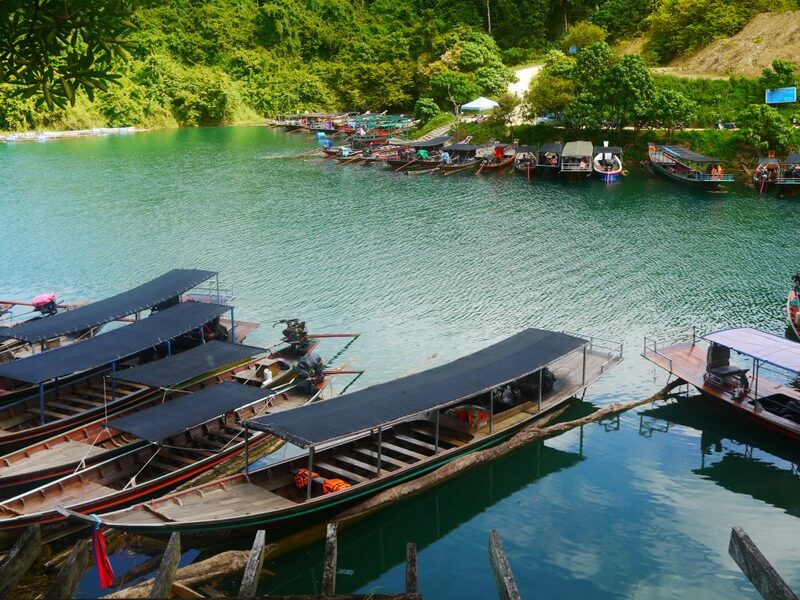 Let’s look into what’s included with a tour on Khao Sok National Park’s lake. How to get to the Khao Sok lake one day tour? Your tour will include pickup and drop-off at your accommodation in Khao Sok. Pick up from your accommodation in Khao Sok is at around 8am. Then you will take a one-hour drive through the Khao Sok National Park, this will be your first chance to gaze at Thailand’s best national park! On your way to the Khao Sok lake tour National Park, you get the chance to stop off at a market and pick up some snacks, use the toilet and grab a drank. I did my usual, bought a bag of bananas for 20 BHT and a cheap cartoon of milk. I always get cartons of milk, they’re cheap and mega tasty. Anyway, you only get 15/20 minutes at the market, then it’s back into the van with the rest of the group for another 20-minute drive to Cheow Lan Lake. Here you will pay a 300 BHT entrance fee to the Khao Sok national park. 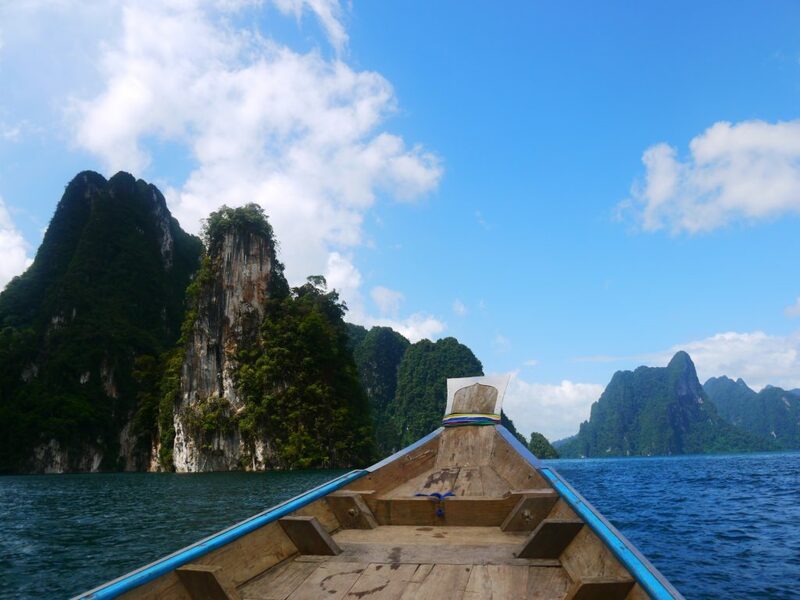 Then, it’s all on a traditional long-tail boat for an unforgettable tour on Khao Sok national park’s Cheow Lan Lake. Just being on Cheow Lan Lake for 2 minutes, I was like S**T this place is unbelievable! This is one of the most jaw-dropping places I have ever seen! Why is this place not screamed about on social media? But it’s a good thing it’s one of Thailand’s secret best places to visit. At times you have the whole of the Khao Sok National park to yourself. The only other place that compared to this is Halong Bay. There are sort of similar beauty and are both completely out of this world. 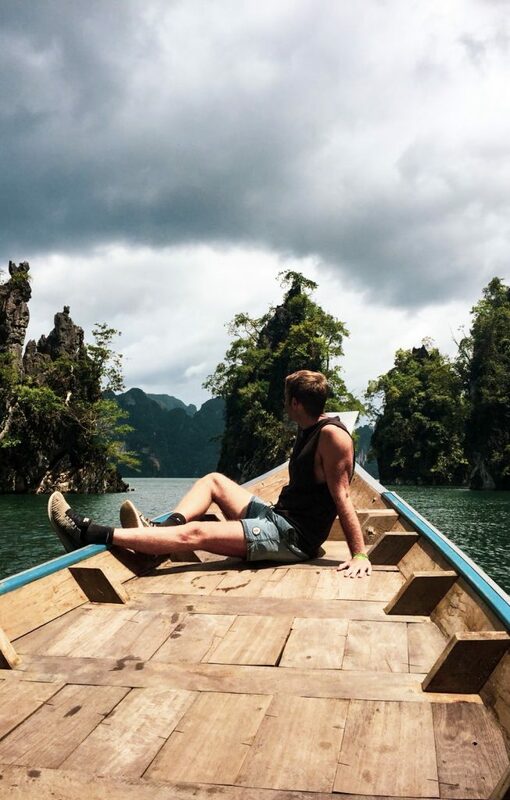 If you want one of the best places to visit in Thailand, without hundreds/thousands of tourists ruining the moment, then you need to do the Khao Sok lake one day tour. After sailing around the Khao Sok lake for roughly an hour. We made our way to the famous Khao Sok lake floating bungalows. The food on the Khao Sok floating bungalows was very good! After dinner on the picturesque floating bungalows, we made our way for an afternoon of jungle trekking in Khao Sok’s national park. The trek consisted of a 3 kilometre hike through tummy high ponds, muddy paths, bamboo formations and waterfalls. Until we reached the Namtalu cave. However, due to high waters we couldn’t enter the cave. Some of the group was gutted by this, but this cave didn’t have anything on the sweet caves in Vietnam. 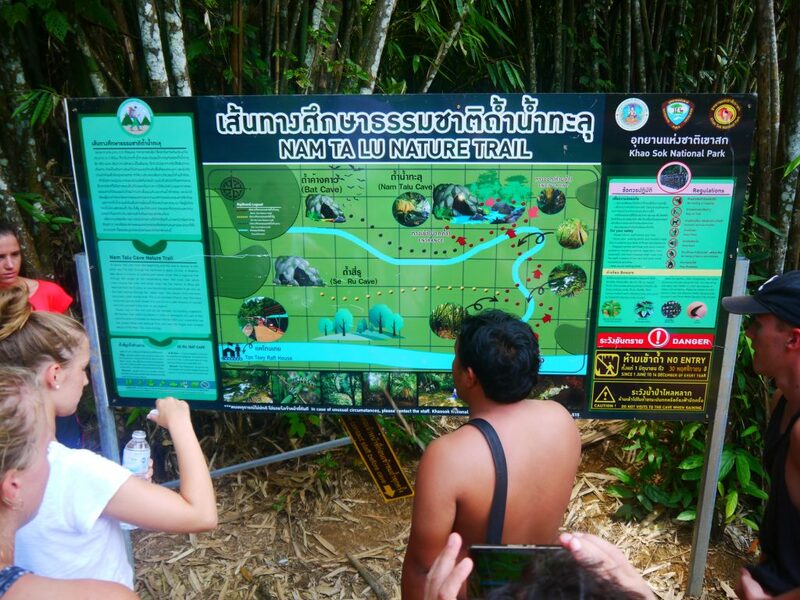 The Khao Sok national park jungle trek, is a hot and sweaty one. However, it is completely worth it. You will loads of fun and it’s a sweet opportunity to chat to the people in your group that are from all walks of life. 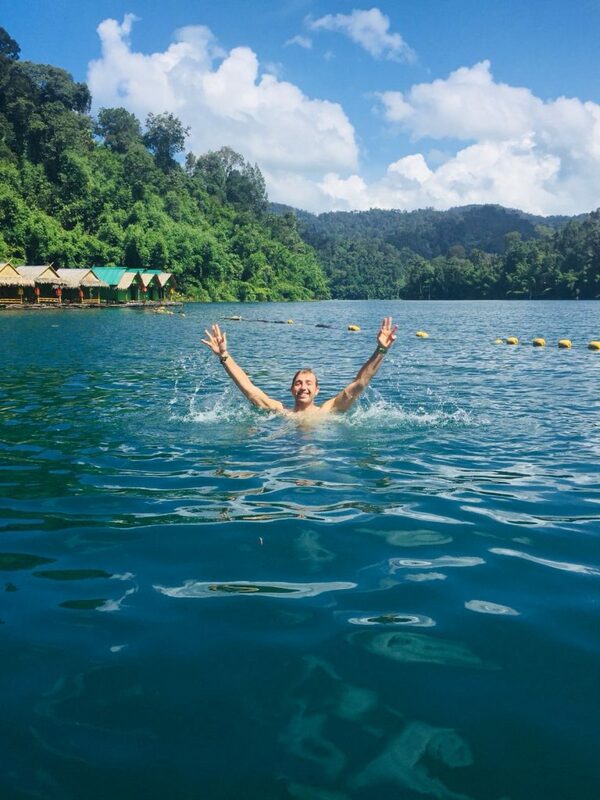 After the jungle trek we made our way back to the floating bungalows for another hour of relaxing, swimming and kayaking in the sweet Khao Sok lake. This was great opportunity to practise some diving and find out if I’m s**t or terrible at front flips into the water. But I was actually okay with the front flips. 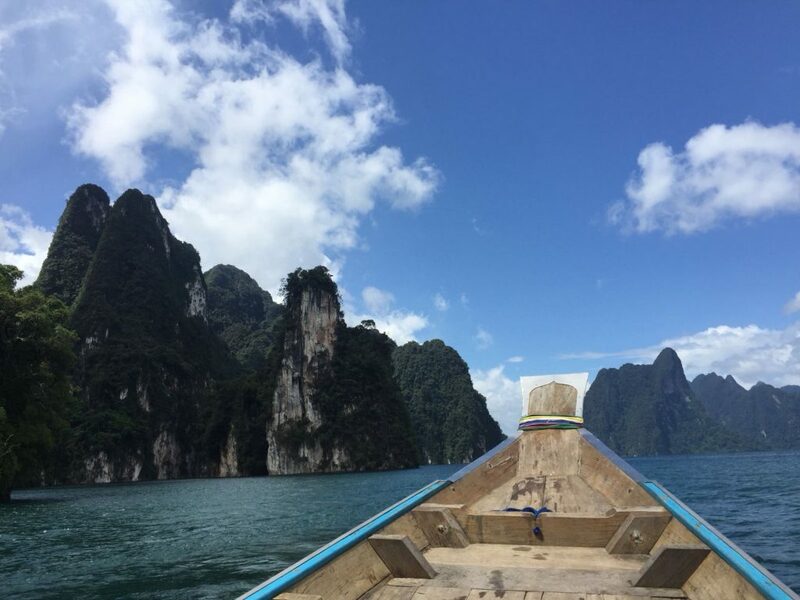 After a final hour of fun with the Khao Sok lake tour, we made our way back across the stunning lake to depart back to our accommodation in Khao Sok. After a jam-packed morning of travelling from Koh Pangan we arrived at Khao Sok Jungle Huts Resort and was greeted by a warm friendly smile. Khao Sok Jungle Huts Resort is located 1km off the highway 401 and is a 10 minute walk from the near by bus station along one straight road. It’s easily sign-posted so you can’t miss it! The resort is also only 900m from Khao Sok National Park Headquarters, perfect for those who want to go trekking to waterfalls or canoeing along Khao Sok River. 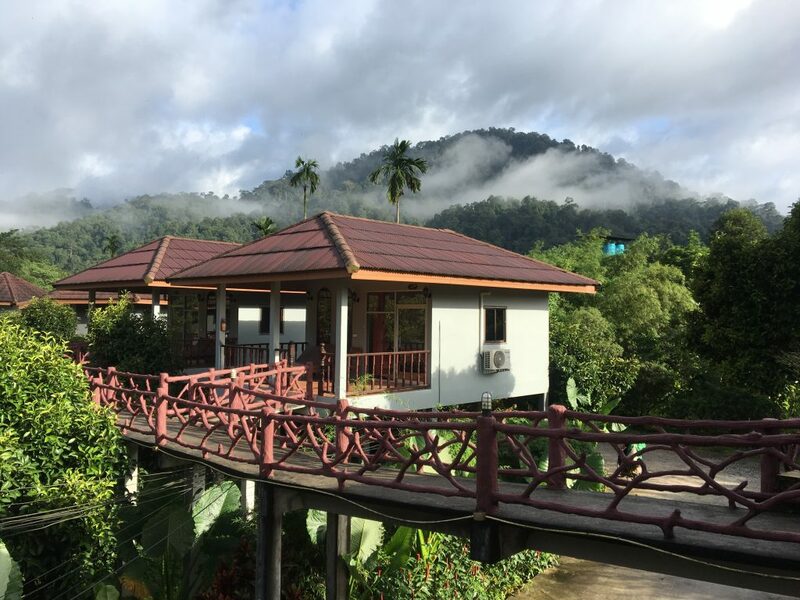 This resorts offers 27 Jungle Huts either with aircon or fan rooms and free WIFI can be accessed in all public and private areas, and yes it does work! We opted for a basic bungalow hut with a fan as this was the cheapest option at the time, costing us £12.50 with breakfast. A bargain if you ask me! Check-in was quick and we were told about what Khao Sok Jungle Huts Resort had to offer, including tour and transport tickets. There’s a long list of tours to choose from including lake tours, Jungle trekking, hot springs and tubing. The tour book provided by Khao Sok Jungle Huts Resort was very informative and we never felt the staff pressured us to book their tours, which makes a change from some of the places we’ve stayed. We were shown to our jungle hut straight away. Set in jungle grounds our bungalow was simple but had everything we needed, a comfy bed, a hot powerful shower, a fan and a mosquito net, best of all it was clean. Also included in the room is a free bottle of water and free toiletries which is always a nice touch. The staff informed us that our room would be cleaned each day if we desired and all we had to do was give our room key into reception. The next morning we sat down for a delicious breakfast, which was included in the daily charge, epic. 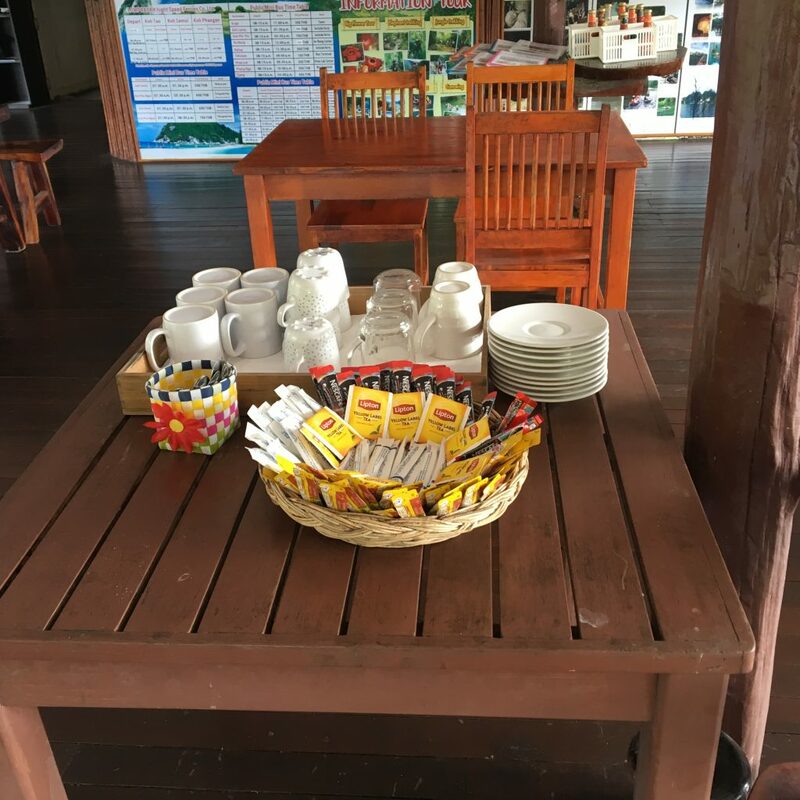 Khao Sok Jungle Huts Resort has a wide range of breakfast options to suit anyone and is available 7:30-10am in the tree top like restaurant. We both opted for the scrambled eggs, cheese, ham and toast, it was a filling breakfast that set us up for our busy day ahead. 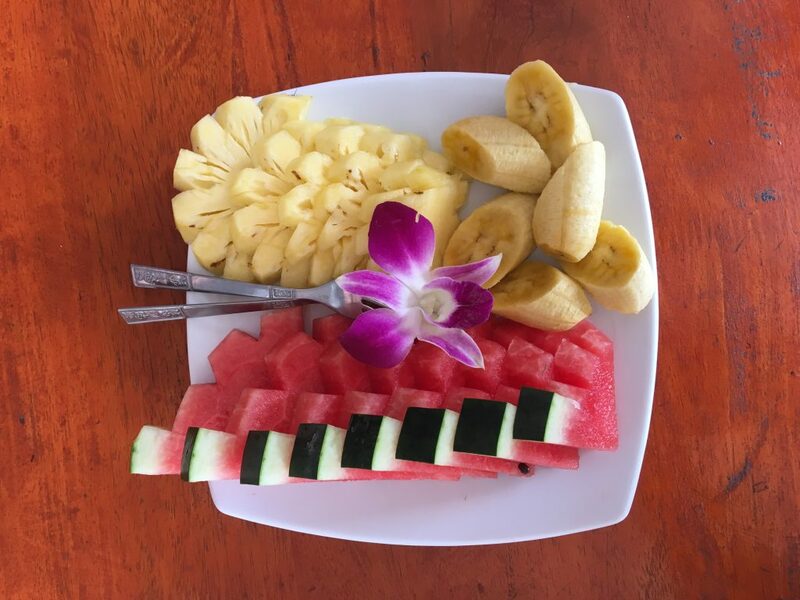 As well as breakfast, Khao Sok Jungle Resorts has a menu full of Asian and European foods at a cheap price, from curries to grilled sandwiches that you can enjoy whilst listening to the jungle life. Free tea and coffee is also provided throughout the day for a caffeine top up or to relax at the end of a busy day with a nice cuppa! Khao Sok Jungle Huts Resort also provides free refillable water which is ace for reducing the number of plastic bottles we have to use and saving us some dollar, it’s the little things that go along way. Overall our stay at Khao Sok Jungle Huts Resort was amazing. 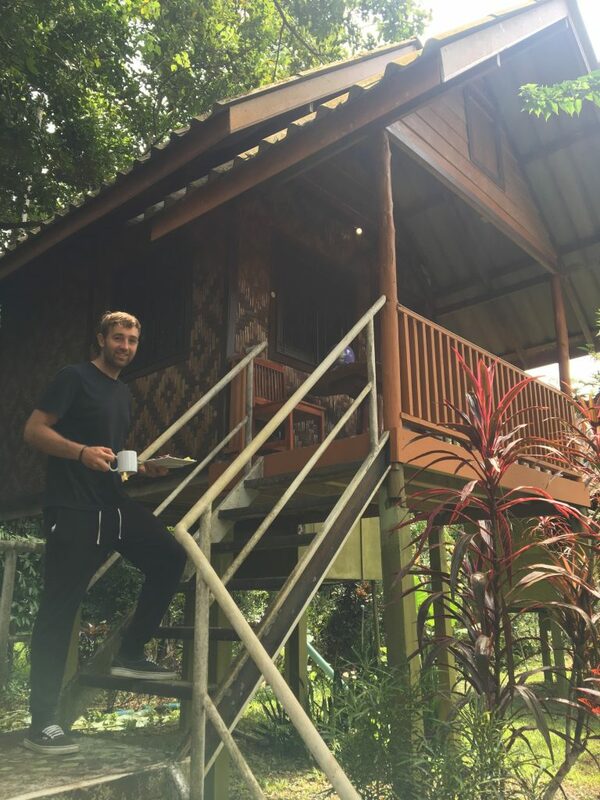 We would recommend this place to both families and couple travellers looking for a relaxing stay in the heart of the jungle at a good price. The staff are amazing and will go that extra step to help you make the most of your time in Khao Sok National Park. Entrance to Khao Sok’s water cave is dependant on the weather. Entrance to Coral cave is an extra 200 BHT. The Khao Sok lake tour gives you the option to choose one of the caves to visit. Take a wet bag for the lake tour and the jungle trek. You will definitely be getting wet at some point! If you can’t go an hour or two without food, take a couple of snacks. 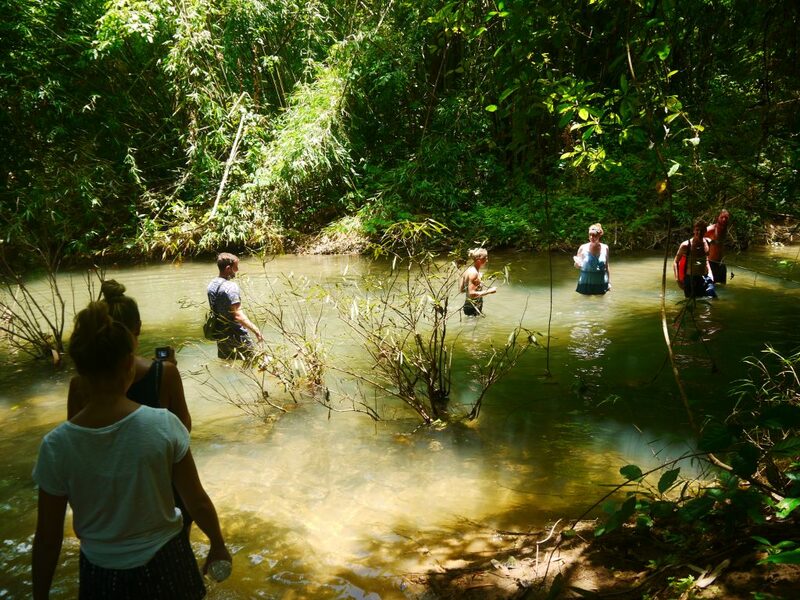 Take mosquito spray, the Khao Sok jungle trek is notorious for bugs! For more backpacking ides look at my backpacking essential item list for Asia for everything you need for travelling. the best beaches on Koh Tao.